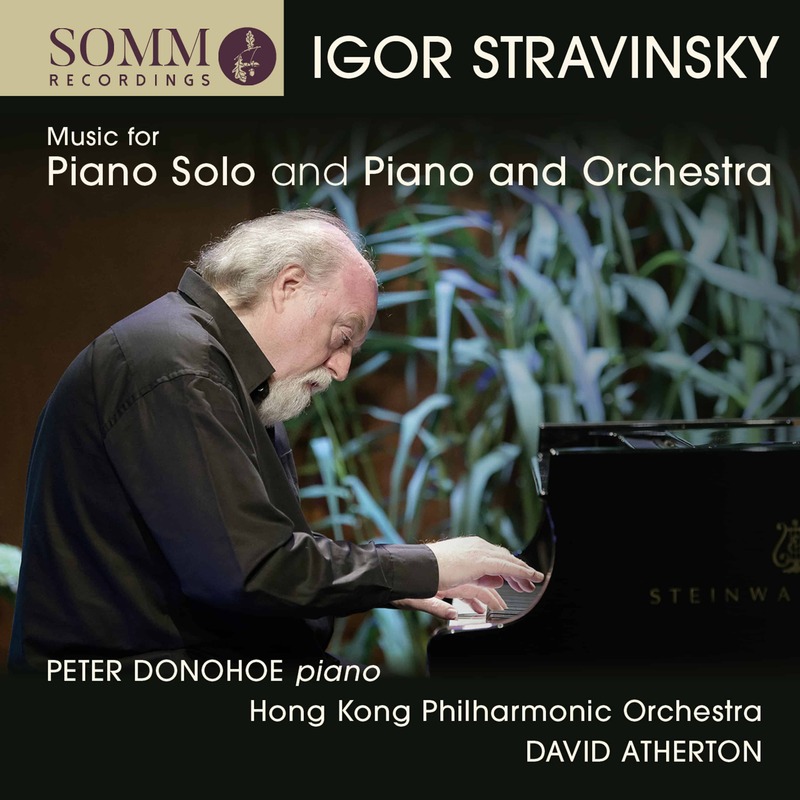 Peter Donohoe’s compelling journey through the complete Prokofiev and subsequently the complete Scriabin Piano Sonatas for SOMM has led him almost irresistibly to the piano music of Stravinsky whose exuberance and many technical challenges he seems to relish. He begins with three movements from Petrushka for solo piano, drawn directly from the ballet by the composer ten years after the completion of the orchestral score. Stravinsky’s goal (together with the jazz-like Piano-Rag-Music) was to encourage pianist Arthur Rubinstein to play his music. His intention was to make the arrangement not only technically challenging but also musically satisfying. Such are its demands however, that even the composer himself only played it once, confessing that he lacked the technique. Stravinsky’s Rite of Spring earned him the fame of an iconoclast who showed utter disregard for the beautiful colours and gentle rhythms of the impressionists. He created instead, a fresh and exciting wave of music for a new age which inevitably divided opinion. His tongue-in-cheek remark during an interview in The Observer that his music was only understood by children and animals also serves to describe its true essence — music of genuine poetic delicacy allied to technical sleight of musical hand. A good example are the Four Etudes, Op. 7 which focus on heightened chromaticisms together with difficult and irregular rhythmical structures for the pianist. This set also includes Stravinsky’s early, charmingly delicate F-sharp minor Sonata which he completed in 1904 but it was only published in 1973. The Piano Sonata of 1924, also included here, was composed during his neo-classical period and pays tribute to the 18th century containing characteristic splashes of baroque brilliance as well as latent romanticism. 1940’s Tango, originally conceived as a song, was composed soon after Stravinsky emigrated to the United States. The works for piano and orchestra on Disc 2 are earlier recordings recorded and released by GMN Inc., about 20 years ago with David Atherton conducting the Hong Kong Philharmonic and Peter Donohoe as soloist: These are Concerto for Piano and Wind Instruments, cast in three contrasting movements and rooted in the composer’s concerto grosso form teeming with fully modern idioms. 1959’s Movements for piano and orchestra written in 5 short movements, shows Stravinsky’s later preoccupation with serialism and his undiminishing appetite for pioneering music which pushed new boundaries. Peter Donohoe ends with the effervescent Capriccio for piano and orchestra. Its composition followed his Ballet Le baiser de la fée and it shares that work’s graceful rhythms and refined melodic style.